In my previous posting on “Friendships Among Long Time Foes”, we have seen wonderful things about the relationships between cats and their long time enemies. Dogs breastfeeding kittens or even play with them. A dog giving ride to a cat with a mouse on top of it. 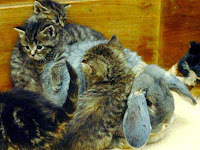 A mommy cat taking care chicks, and a rabbit being a surrogate mom with kittens. This time I found love stories between cats and humans are far beyond our imagination. One afternoon last year, I was astonished to see on TV that a middle-aged woman breastfeeds her cat in a village somewhere in Indonesia. It was reported by a national channel news. Furthermore, her husband did not mind at all. At first, I thought it was happening only in Indonesia. Then, I made some little research in the internet – thanks to Uncle Google and Auntie Yahoo for their help - similar occurrence has happened too in Japan. Until know, it is unknown for me whether these events are considered bizarre or become lost in bedazzlement. Such a mind-boggling thing what love can do to people and their beloved animal companions. Another remarkable story is about a woman in Columbia found a lion cub, who was wounded and hungry. She took him home and raised him until he was too big. She then gave him to the local zoo, where she visits him every day. Take a closer look on how this lion hugs, kisses her and even smiling at her in the video below, exactly just like human to human. Again, my breath has been taken away by this lion behavior and how the way he treated the woman. A human touch does have significant impact strongly in this wild creature emotion. Although the big cats are popular by their untamed and well-known beasts, however this story unravels the common paradigm. Now it is proven a big cat can have the heart and behavior like human. A true love has trespassing beyond all boundaries. Oh wowie kazowie, that video of the lion maded Momma's day. How preshus! That is one of the sweetest things we Ballicai have seen. What love between the big lion boy and his human furriend! *sniff*, but *happy sniff*. Thankies so much fur sharin! Hmmmn, Love against all odds.. nice title... I also get inspired whenever I see human getting too much attachments with their pets. I love the video of the lion! I so would have a big cat, lion or tiger if I could!!! That is a wonderful video, you made me day! hello! i am doing well thanks! How is yoo? I'm really glad that i don't have to live wif woofies. i hates them. Hi, I was glad that you stopped by our site and gave us a visit. An animal knows when humans want to help them, hence nursing a kitten or tending to a lion that was hurt. Wonder what other people thought when they saw the lion hug her special human. Love is what makes the world go round. To bad there are so many people incapable of love. Mom sure loves us. oh wow! look at that big lion being so sweet. i love it! I yam astonished at da videoz...but den again, da animalz iz so much angelz. Wouldn't you say? It iz we humanz dat haz to learn from dem. Amazing. Even a playful lion can be dangerous, though. yup, it's so amazing to see how a well-known beast like lion can be tackled by love and acted so lovingly toward human:) and, even love can make humans do something that people would not dare to imagine, getting too much attachment with our beloved furry companions at home? or, is it just being too much love and care furr them?